Crisis In Japan: 10,000 Known To Have Died; Another 17,000 Missing : The Two-Way Two weeks after a 9.0-magnitude earthquake sent a massive tsunami crashing into the northeast coast of Japan, the grim numbers continue to rise. 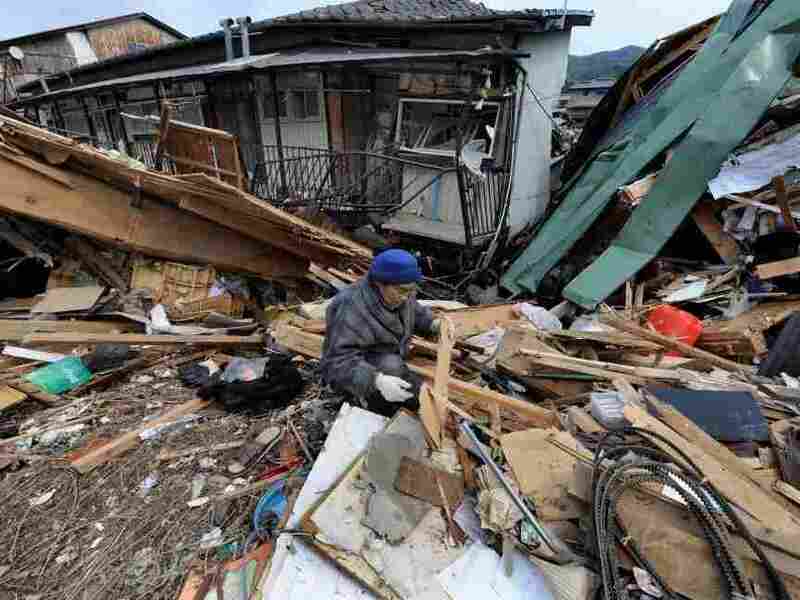 This man was searching through debris in Kesennuma, Miyagi prefecture, earlier today (March 25, 2011). Two weeks after a 9.0-magnitude earthquake sent a massive tsunami crashing into the northeast coast of Japan, the country's National Police Agency says the number of people known to have died stands at 10,102 and that 17,053 people are missing, Kyodo News says. And, it adds that "the full extent of loss of life remains unclear, partly because search efforts in Fukushima Prefecture have been hampered by the nuclear emergency, while in Miyagi Prefecture local police have suggested it is likely that more bodies will be recovered from the sea."